Jackie Foster as quoted on the front page wasn’t sure whether Jimmy had been a runner or not – well he had been! As a member of the Glasgow YMCA club (vest: white with a red triangle front and back) and ran for them in many races including the Edinburgh to Glasgow where he ran the last leg in 1938, 1939, 1949, 1951 and 1952. He was basically a club runner – not a star and not one who would have qualified for the rhinoceros or superman or school girls costumes favoured by many in the London marathon nowadays. The last race that I have any information for him running was the Goat Fell on Arran in 1955. He was a prolific racer – eg at the end of 1953 he raced on 25th July in the Ben Nevis race, on the 8th August it was the Carluke 12, 15th August saw him in the Milngavie 10, 22nd August and he was in action in the Bute HG 11 miles, 29th August and it was the Perth to Dundee 22 miles and on the 5th September he raced in the Shotts 15 miler. Although he is best remembered as an official, he knew what runners went through and understood their needs. He was a member of the Glasgow YMCA club – there were many YMCA clubs around at the time and some like Irvine YMCA, Motherwell YMCA, Kirkcaldy YMCA and Glasgow YMCA – operated at a fairly high level. When he became secretary of the SMC there was a bit of friction with the YMCA that he was spending too much time on the SMC business and not enough on theirs. They were short of members, particularly senior members, and eventually went defunct in 1955. This solved the problem for him and eventually when he had to join a club he chose Lochaber AC. Having been in the Army during the War he worked for the BICC in Glasgow (British Insulation Calendar Cables) and then moved to the East of Scotland for a spell before returning to the West and settling in Dalry. He encouraged many runners such as Bob Donald to take up road running. We know he was Secretary Treasurer of the club in 1950 because that is as far back as the extant Minute Books go and he held the post until his death in 1977. 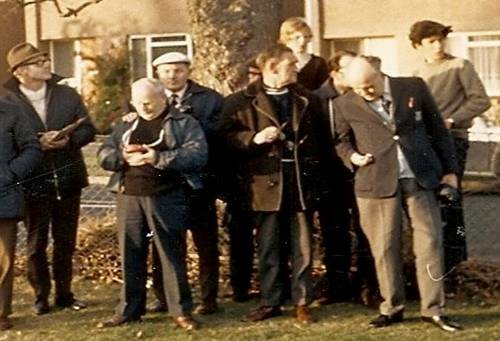 He always had room in his car for runners and when he bought the minibus he took many more SMC members to races. From my own point of view he took me to the Mamore Hill Race in Kinlochleven, to the Edinburgh to North Berwick, to the Dundee ASA 12 Miles and to the Brechin Right of Way race among others. Always thinking of runners – he never battered straight through to the venue – he knew when the runners needed to eat before the race and stopped for lunch or whatever accordingly. He had his favourite stopping places as well – the Croit Anna outside Fort William, the Four Ways at Dunblane the Green Kettle at Bridge of Orchy that I knew of. 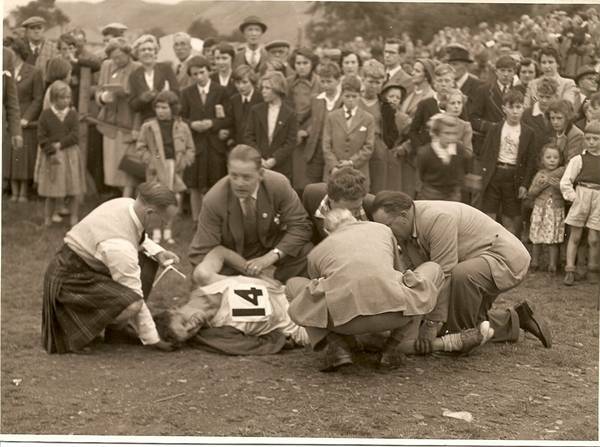 He filled many positions at races – at some he was the race organiser from the ground up, at others he was marksman and timekeeper, at others he was the feeding stations on the route and the picture below shows him in his kilt administering first aid at the Ben Nevis Race (in which he had competed himself). He was at the SMC Committee Meeting on 6th September 1976 and contributed as usual to proceedings with reports on races and he even agreed to be on the sub committee to advise on the McNab Robertson Trophy. Then at the next meeting on 30th March 1977 appears the following announcement :”Mr J Geddes opened the meeting by speaking of the great loss to the club on the 1st March when our long serving secretary and treasurer Jimmy Scott died. J Geddes called for a period of silence before proceeding with the business.” It was strange that his friend and the other main influence on the SMC, Dunky Wright had also died less than nine months before on 21st August 1976. Duncan had the contacts and the charisma but Jimmy did all the real day to day work that made the club tick and it was a real blow when he died. It was a month or two before a replacement was found and even then the job had to be split up. 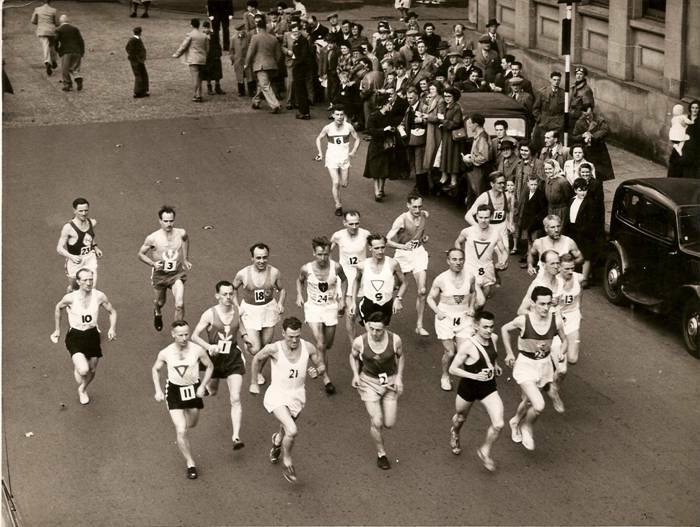 The picture is of Jimmy at the start of the Perth to Dundee in 1951 – he is the one wearing number 11. (Also in the picture are Joe McGhee (27), Charlie Robertson (3), Harry Howard (21), Gordon Porteous (7), Alex Kidd (6), Duncan McFarlane (10), Bob Donald (9) and Harry Haughie (23) among others. The Monkland runner in the foreground in Andy Arbuckle.